Tiffin is the British answer to Australia’s Rocky Road- a no-bake delight full of tasty morsels bound together in cocoa-y goodness. It was invented in Scotland in the early 1900s. Though traditionally filled with a mix of raisins and biscuits, this is the twenty first century, peeps. We can do better than that. Also, loads of folks don’t like raisins, so there’s that. My adorable pal Davi introduced me to his version of this delight a few months when he had me over for his birthday. I was hooked. When Valentine’s day came round a few weeks later, and I wanted to make some chocolatey treats for my nearest and dearest, and this sprang to mind. A traditional tiffin is pretty basic, and can be serves as is or topped with dark chocolate. One, I think we can all guess which option I chose. Two, I decided to step things up with some extra fillings. I take my confection-making pretty darn seriously, after all, and nothing is more serious than gosh darn mini marshmallows. Line a 9×9 pan with parchment. If you trust your non-stick, you’ll probably get away with just a sheet across the bottom and up two of the sides. In a milk pan, melt together the butter, sugar, syrup and cocoa into a delicious, dark paste. Take off the heat when combined. Crush up the biscuits into roughly 1-2cm pieces. Retain all the crumbs and shards, as these will give the tiffin bulk. Add your biscuits and fruits (the cherries can be chopped if you like, but they look gorgeous sliced through whole in the finished product) to the paste and mix, mix, mix. It will cover everything, I promise, you just have to be patient and mush up those biscuits as you go. Add your marshmallows and mix through a few times. You can add them with everything else, but I like to leave them only half incorporated. Spread the mix out into your tin to an even thickness. Melt your chocolate, either in a bain marie or in the microwave, taking care not to burn it. Spread the chocolate out over the top of the tiffin to almost seal the top of it. FYI, You will need more chocolate than this if you use a pan with the larger surface area than the recommended 9×9, and depending on your taste, you may wish to use more anyway. Pop the tin in the fridge for 1hr or so, until the confection is set. Chop up into inch squares and serve in a glorious mound of joy. This stuff lasts well in an airtight container out of the fridge or in, and tastes awesome. Of course, it is super customisable with different biscuits, chocolate, fruits, nuts and even jelly beans or sweets if you like- just stick in what you like, leave out what you don’t. It’s also very rich, so even a chocoholic like me can’t trough the lot in one go, so that 9×9 worth of mix will go a really long way. This recipe is so easy, too. If you have a microwave, you can make this. You can do the first step in a microwave if you need to, just melt everything in short bursts and stir in between. I hope you’ll give this a go. It’s ‘civilised’ enough for a picnic or party, but relaxed enough for a night in with friends too. And it goes great with tea. Whilst they weren’t the first thing I ever learnt to bake, Flapjacks evoke strong and nostalgic memories for me. I remember in year four or five bringing home a tin of flapjacks I had made in cookery class at school, and presenting them to my parents. They were mostly stuck to the greaseproof paper, and I remember the sweet gooiness of them, between picking out bits of chewy tacky paper. I think my father snuck most of them. Valentines Day holds no happy memories for me, so every year I have two choices- stay very busy, or wallow. Either way, I eat my weight in chocolate. This year I arranged days out and visiting with friends, and, erm, a date for the inauspicious weekend, and baked up a storm of choccy drenched treats for my friends. 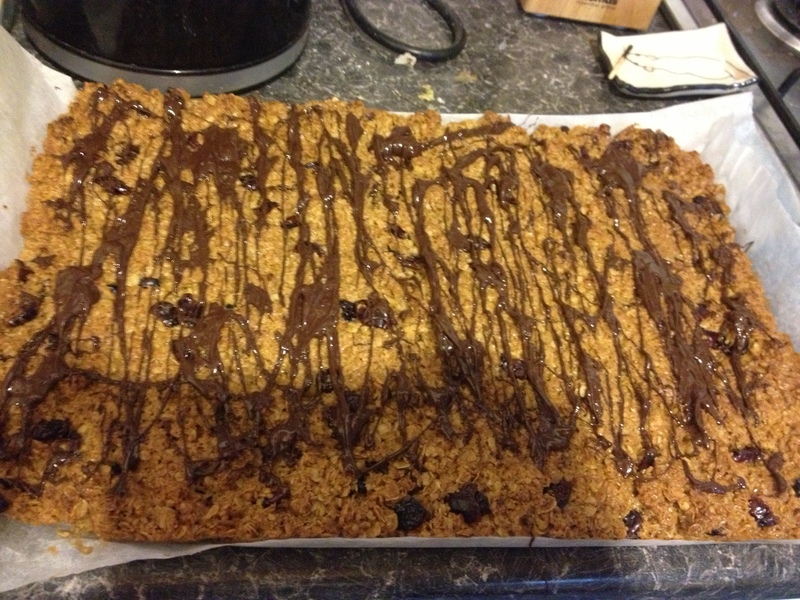 This included my first venture in perhaps twenty years into flapjack making. Which is ridiculous, really, because they are sickeningly simple and damned delicious. The ingredient breakdown for this recipe is so easy to remember, it’s become a staple bake for me. You can substitute the honey for golden syrup, but unless you do this for diet reasons I will judge you quite a bit. Honey is infinitely tastier. That being said, should you be of the Vegan persuasion, then of course, substitute in syrup for honey and any Vegan friendly spread for the butter (I recommend Pure). Line a Swiss Roll tin, or any 13″ x 9″ pan with a strip of greaseproof paper, and preheat the oven to 180 c.
In saucepan, melt together the butter, honey and sugar. Do not allow to boil- just heat and stir until the sugar is dissolved, the butter melted, and the whole glorious mixture is combined. Next, dump in your oats in roughly half batches and stir in until the liquid coats the oats and you have no dryness of spare fluid. Mix the cranberries in, and spoon out the mix onto your tray, pressing down and flattening with your spoon into the corners. Bake for 15-20 minutes until golden. If you over bake don’t worry, they’ll just be more cookie like than chewy. Once cool, melt the chocolate in the microwave or a bain marie, taking care not to burn it. Kiss the surface of the flapjacks with trickles and drizzles and blobs of cocoa-y goodness, and let it set at room temperature. To serve, lift the sheet of paper to remove the flapjacks in one fell swoop, and chop into generous bars or squares. Store in a airtight container for up to 10 days… if they last 10 minutes, that is. Obviously you can omit the chocolate if you hate yourself, or substitute in any fillings you like (including, of course, chocolate). However the sweet, bright tartness of the cranberries is perfect with the comforting, sweet and rich oaty base. Whatever you do, be sure not to skimp. Never go under 60g of filling, or else it’ll be too sparse in the mixture. Savoury snacks are great at this time of year, and the humble cheese straw is the perfect thing to get you in the party mood. Now, I like cheese straws, but I *really* like cheese, so when it comes to my christmas time nibbles, there’s nothing better than my Cheesy Reindeer. Basically a very short pastry with the cheese making up most of the fat content, these treats are so delicious, I get requests for these every year. And for me, they have to be in a reindeer shape. They just do. Grate the cheese, then combine the ingredients in a food processor to form a crumb. Knead the mix into a dough. You can use it immediately, but you may find it easier to use if chilled for 20 minutes. Roll out the dough to a 1/8 inch thickness and cut out into your desired shape. Place on greased or lined baking sheets. Bake for 8-10 minutes at 180 c.
Obviously these are great for parties the year round, but it’s also an great way to use up odds and ends from a cheese board, or whatever is in your fridge. You can use any flavoursome cheese to make these- obviously the softer the cheese, and the warmer the dough when rolled, the softer and potentially stickier the dough will be. I love the cheddar and poppy seed combo, but I have used Wensleydale with cranberries before, and a smoked cheese with a little paprika will also work a charm. 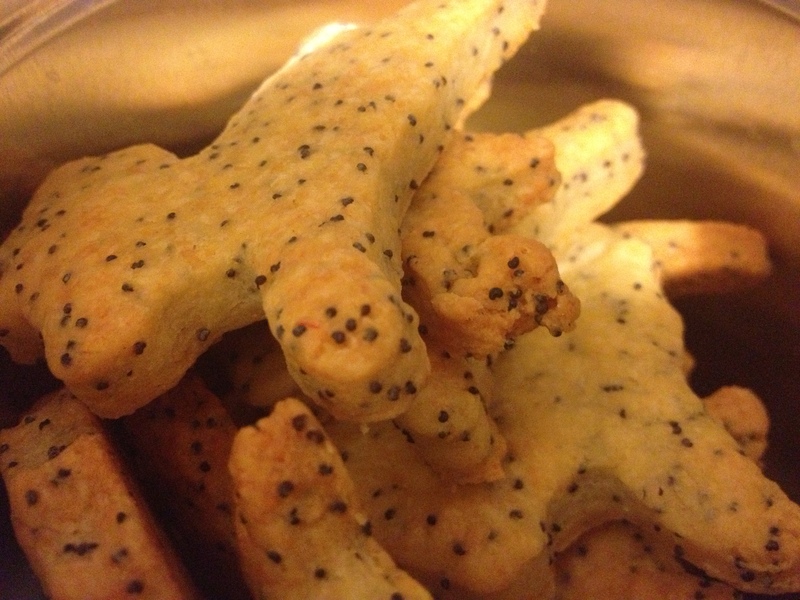 You can substitute the poppy seeds easily for sesame, or use the latter to top the biscuits for extra flair, or use the same volume of chopped sun dried tomatoes for a pizza-y taste. The recipe is very versatile that way, and can be used right away if needed or stored in the fridge until required for several days, or even frozen. 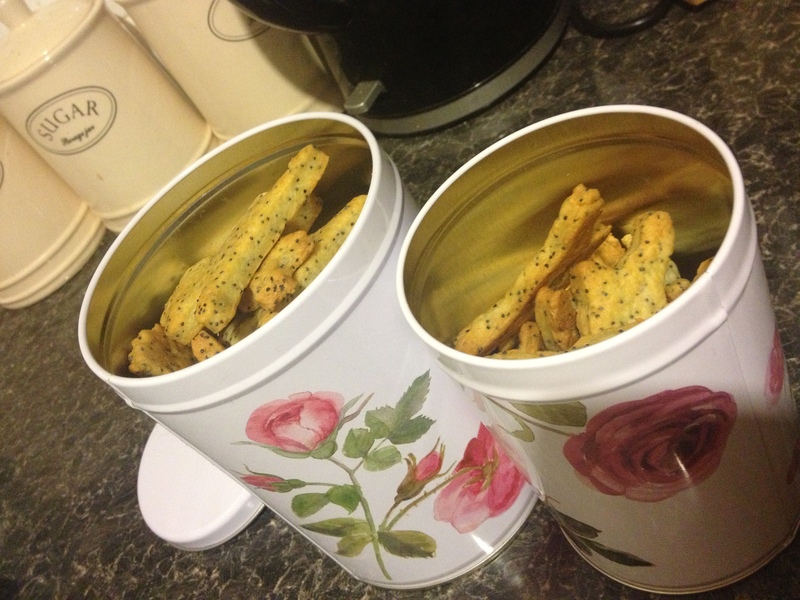 The biscuits do taste best within a day of baking, but they will last in an airtight container for up to 5 days. Sometimes, simple pleasures are the best. Regardless of the fact it’s nearly Christmas and anyone into that sort of thing is probably borderline insane by now, when you need a treat to relax you, the last thing you want is complicated. When it comes to baking, I often don’t get time to do anything until it’s nearly bed time anyway- if putting the thing together, let alone the cook time, is going to have me up until the wee hours, I won’t do it, and will still grumble when I’ve got no home made nibbles to graze on later. My Chocolate Almond Sugar Cookies are simple. They’re tolerant. You can mistreat them a bit, rush their prep by dumping all the ingredients at once in mixer if you have to to, and they won’t complain. You can abandon their dough in the fridge for days on end, and they’ll still let you roll them out as sweet as if they were fresh mixed. You can cram them in on the trays and they’ll still keep their shape. They know your life is tough, and you’re busy, and you just want a cocoa hit to get you through. You can spread the bake out over scraps of time between your busy periods; two days, a week if you need to, and it’ll still taste just as good, every time. These cookies, they understand it’s hard out there, and they forgive, and they provide. Mix flour, cocoa and baking powder in a bowl. I whisk-mix to save me having to sieve it! Cream butter and sugar by hand or in a mixer. Chill for at least 1 hour but can be left for much longer, and will still behave when you get it out to roll and cut. Roll out thin (thickness of a pound coin or less) and cut your shapes. This dough won’t rise too much, if at all, so you don’t have to leave massive gaps between the cookies on your greased baking tray. Chill the cut cookies for five minutes in the fridge, then bake in a preheated oven at 180-200 (depending on how hot your oven cooks) for 6-9 minutes. 200 and 7 works for me. As you can tell from the photo, when I got round to baking the dough I did sat at my coffee table (thoroughly cleaned first, of course), watching some good Christmassy TV, leisurely rolling and cutting and baking for several hours on a sunday afternoon. The dough doesn’t need re-chilling if you are going to do that- it really is the best behaved cookie dough I’ve ever made. If this recipe has one fatal flaw, it is too delicious. I can’t stop eating them. I’ve given two bags away to friends (this recipe does make a fair amount of biscuits, and you can easily cut the measures in half for a smaller batch) and I still have plenty left, but I’m going to have to make more. I mean, what if people come round for tea? Pictures are up on Tumblr, as ever.